Hey Barry: Ludacris has a message for you. In what can only be described as lightning striking twice, Wally West gained the same incredible powers as his idol, the Flash. While visiting his uncle, Barry Allen, Wally was doused in electrified chemicals. When lightning struck Allen's lab, a virtual replay of the accident that had imbued Allen with superspeed years earlier occurred. Discovering that Allen and the Flash were one in the same, Wally was even more thrilled when he was given the opportunity to be the Scarlet Speedster's sidekick, Kid Flash, and eventually took on the mantel of The Flash himself. We want to take a moment to give Mattel credit for that bio. It's almost identical to the text on the back of the card for DCUC7 Kid Flash, which makes sense since they're the same person and the origin carried over, but they made a few grammar changes to keep it from being a direct copy - just a matter of moving some punctuation and adding a word or two, but it shows more effort than cutting and pasting old info. When Barry Allen died during Crisis, Wally West became the first superhero sidekick to fulfill the promise and take over his mentor's role. For the first few years he wore the same costume that Barry had worn since 1956 (hopefully after laundering it at least one time). Then, in The Flash #50, Wally got a new costume (designed by his friends at STAR Labs) that was still clearly related to the one that had gone before, but was something new. It was darker and metallic and the shapes of the lightning bolts had been changed, but it was still the Flash. And it's about time Mattel made a toy of that costume. 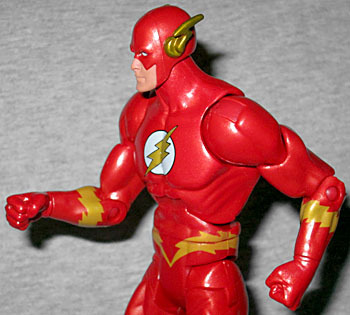 The figure uses the same DCUC "Small Male" body that all the previous Flashes have used, but it works better for Wally than it ever did for Barry. Why? 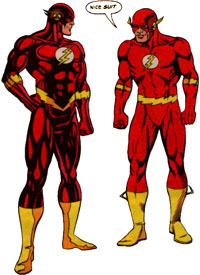 Because Wally's always been more muscular, while Barry was thin and scrawny. He gets the Flash-specific boots, with the deeply ridged soles and the lines that I previously called sculpted seams, but now I think are actually just a parting line. Wally's boots don't have wings on them, which means the shins had to be remolded - there's no hole in the side where the wing would have gone. The head is entirely new. Not only do Wally's ear-wings have a unique shape (less like feathers and more like lightning bolts), but his mask fits differently as well: rather than leaving big gaps around his eyes, he has little white lenses. He's also sculpted with a little bit of a smirk, which is totally in-character for him. 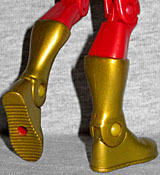 The figure is a metallic red, with golden accents. 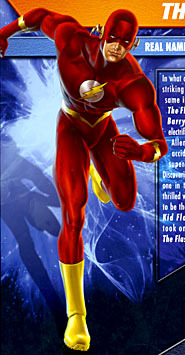 Compared to the old Flash costume, the lightning bolts around the forearms are thicker, and instead of going straight around the waist, the belt area now comes to a point in the front. The bolt in the circle on his chest is wider than before, but that has more to do with the paint masks for this figure than the actual design. And of course, like we said, his eyes are blank white, with a thin black line over the top to create contrast. He gets no accessories, but then, he doesn't really use any; at least not any that would make sense for an action figure. The Flash is the book that made Mike Wieringo my favorite artist, so in my mind, his art is the "perfect" version of the Flash. That said, I really like the Mike Thompson portrait on the back of the box here. Wally is pictured in mid-run, obviously; in fact, now that we look at it, the pose seems inspired by the famous cover of Showcase #4! One foot down, one bent back, arm crossed over in front of his chest... it's not like it was traced from that cover, but the parallels are there. Conscious choice, or just a coincidence based on the fact that there are only so many ways to show someone running? There's a shadow trailing away from the figure's foot: it's just a skewed copy of the image, so we're guessing that was done when the package was put together, not there from the beginning. We've been waiting for Mattel to make a Wally West figure for years now, and he turned out about as well as could be expected. Remember, while this may seem like a no-brainer, they could have chosen to go with that lame version Ethan Van Scriver designed for Flash: Rebirth. Fortunately, that costume seems to have been swept under the rug: DC, recognizing that as long as we were all still waiting for Wally to get the headliner gig back, no one was ever going to care about Barry Allen's return, have just straight-up left Wally out of the New 52 reboot. DC pushes Barry Allen the way Microsoft pushes Bing: laboring under the delusion that if they just keep forcing their product down our throats, eventually we'll stop using Google. Yeah, good luck with that. And now that we've finally got our Wally West toy, Mattel? Impulse.